There was a time when almost every backyard in Australia had a chook house, an outdoor dunny, a vegetable garden and either a Hills Hoist or a clothes line propped up with a stick. 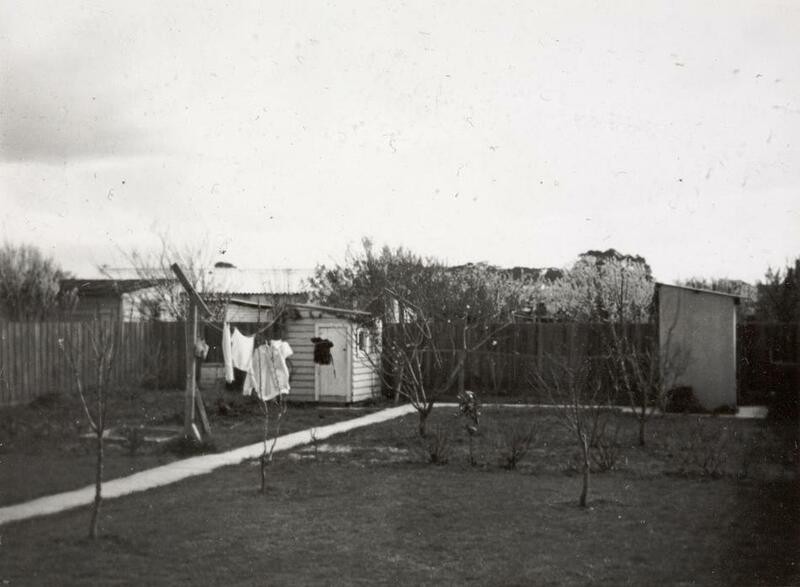 Here’s a photo (below) from 1960 of a typical Australian suburban backyard which also includes a number of fruit trees. Photo from Museum Victoria. A typical backyard for the 50s and 60s, a fowl house, outside lavatory and a clothes line. One of the children who lived in this home, Michele Dominiewski recalls; “It was too far to go out to the toilet at night so the kids had a bucket inside for night time. Many of the lavatories back then were long-drops too and housed all sorts of creepy spiders (like redbacks), and rodents. As a kid it was a frightening experience to have to go to the lav at night….I think that’s how some of us first developed constipation!! When I was growing up, I remember how my father had almost all of the backyard turned into a vegetable patch. He grew potatoes, carrots, tomatoes, cucumbers etc, and I always remember his big lucerne patch, which I think, from memory, he fed to the fowls. I believe the reason our parents grew most of their own vegetables, was first and foremost, a financial necessity. Most families then survived on a single income, with dad as the bread-winner and mum stayed at home to cook, clean and do the housework. It also followed on from their parents, who had lived through a depression and had taught their children (our parents) to be self-sufficient and not rely on anyone else for anything. Photo from State Library of SA. The Hills Hoist eventually replaced the old clothes line. Excess fruit and vegies were also traded, as were jams and relishes. One of our neighbours used to catch and smoke fish which might be traded for tomatoes or fresh eggs. Another neighbour was an electrician by trade and would repair electrical appliances in exchange for fruit and vegetables. And yes, some of the hens would peck at you if you went in or near the fowl house, although I remember my sister had several hens that she used to ‘mother’. One in particular was a very docile old thing and sis would wheel her around in her doll’s pram. The rooster however was a vicious bird and would attack anyone who ventured inside the fowl house or anywhere near it. Every year at Christmas one of the hens would have its head chopped off and be plucked and gutted, stuffed and cooked for Christmas day lunch. It was the only time in the year I can remember us actually eating chicken. The Hills Hoist eventually replaced the old clothesline and doubled as something else to keep the kids occupied….when our parents weren’t looking we would go for a ‘whizzy’ on it. That would always get us into trouble though, because mum was frightened we would bend the arms, or even break it completely. These days, with smaller residential blocks, very few families keep chooks, most people no longer have the time to tend and care for a big vegetable garden and the lavatory (or toilet) is generally inside. Unfortunately the kids don’t have as much room to play in the backyard as we did back then. What memories do you have of those years when you were growing up? 4 Responses to A Chookhouse, the Dunny and a Hills Hoist. Reminds me of my grandparents back yard in the 80s (minus the dunny down the back of the yard).